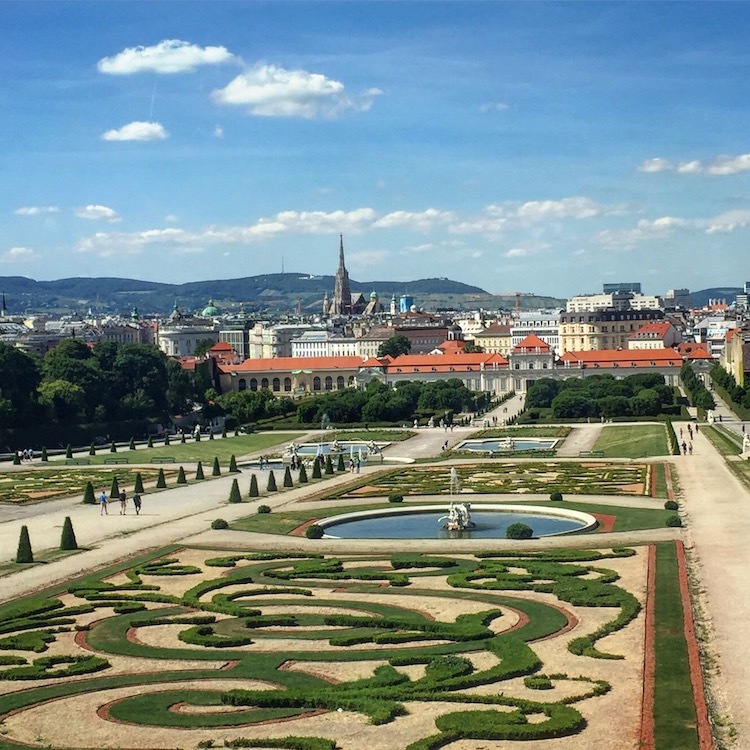 Among romantic things to do in Vienna are visiting its world class art museums, explore its gorgeous architecture, and share pastries while sipping coffee in luxurious cafes, says World Traveling Mom Sarah Ricks. 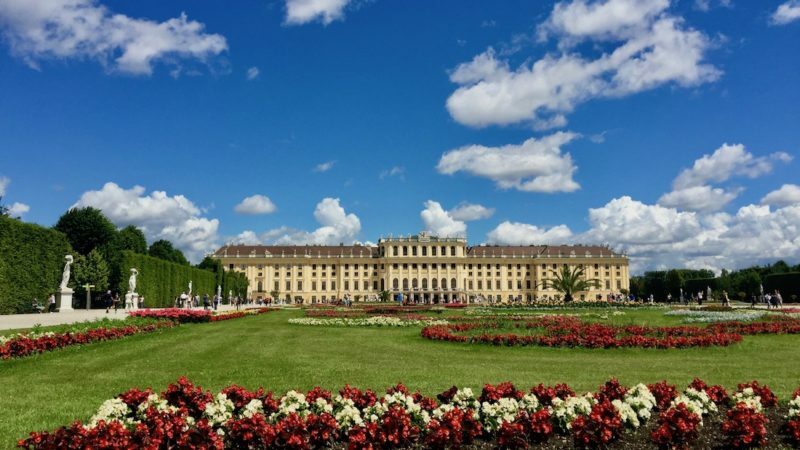 A Vienna date idea is to tour an opulently furnished royal palace, pull up a chair with locals to enjoy a performance at the elegant Opera House – and other romantic things to do in Vienna. Vienna, Austria is an elegant confection of a city. 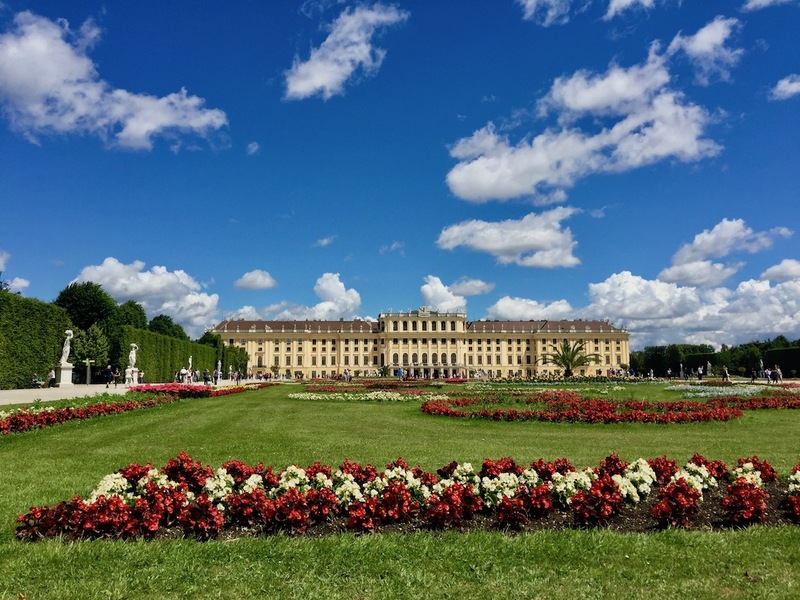 After four visits to Vienna last summer, one with our daughter and three with just my husband and myself, I’ve whittled the list to 9 most romantic things to do in Vienna. 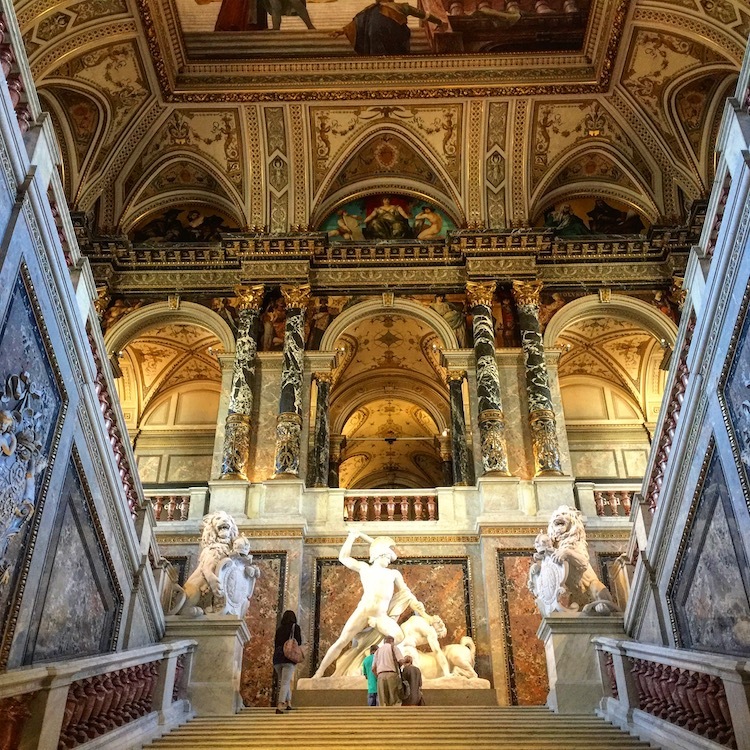 How could visiting the Belvedere Palace art museum not be among the romantic things to do in Vienna? After all, it is the home of The Kiss, painted by Gustave Klimt. The painting is so popular, it has its own room to take selfies (with a reproduction). The museum’s grounds are lovely. So is their view of Vienna. As good as the Belvedere is, the Kunsthistorisches Museum is even better. Breughel, Titian, Raphael, Caravaggio, Durer. This is one of the world’s great art collections. And the ornate marble building itself is stunning. The grand staircase welcomed us, and a white marble Canova statue pointed the way to the paintings. Enjoy Opera House Performance – for free! 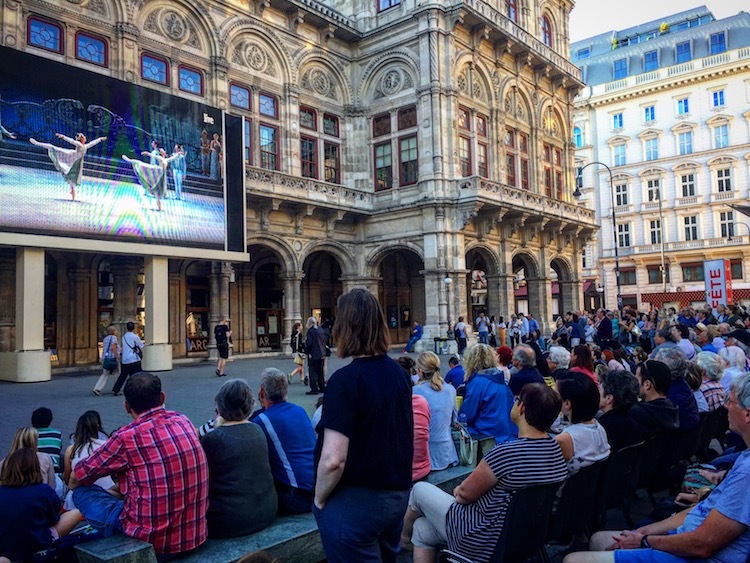 The gorgeous Vienna Opera House broadcasts its performances onto a big screen outside. On the sidewalk, locals pull up chairs to enjoy opera, ballet, and other performances broadcast live from the stage inside. This Vienna date idea is to do like the locals. My husband and I cozied up on the sidewalk with the cheerful crowd of a hundred and took in the ballet. Enjoying a performance without shelling out a dime – definitely among the romantic things to do in Vienna. We glimpsed how the former royal family lived at Schonbrunn Palace. And this massive palace of over 1000 rooms was just a summer house. The palace grounds are a huge garden park. 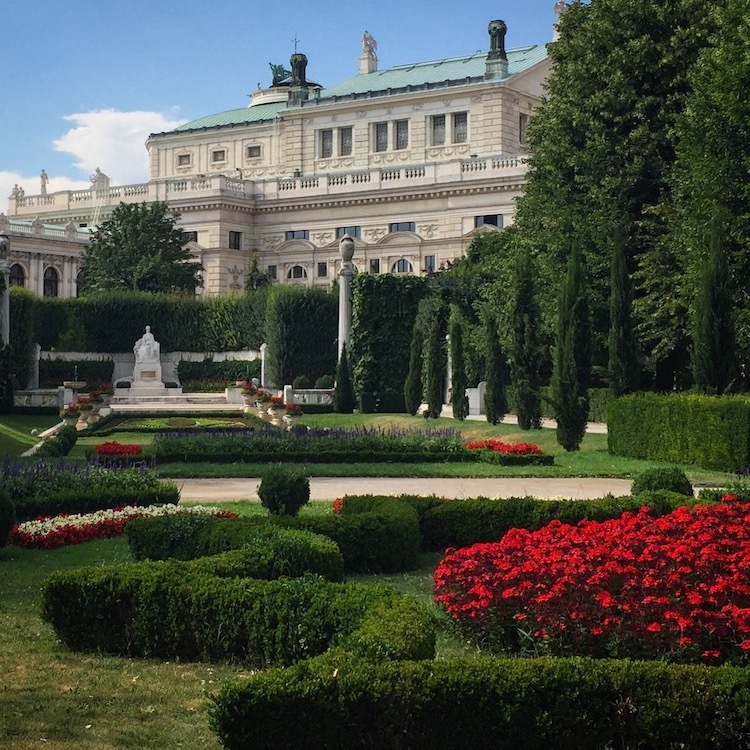 And wandering its gardens is among the romantic things to do in Vienna. First, we explored its flower gardens, fountains, and tree-lined pathways. While we skipped the zoo, we were lucky that the garden’s tunnel of roses was blooming (in June). After wandering the Schonbrunn Palace grounds, we rested with a drink in the elegant hilltop pavilion. Apparently, the royal family used this spot for summer dinners. Its massive arched windows made it feel like the building was made of glass. Best of all, from its hilltop setting, we had a great view of Vienna. Finally, we went inside the palace for a guided tour. The lavishly furnished Royal Apartments were sumptuous. Every surface is colorfully decorated, including walls and ceilings. Even though we only visited about 30 rooms, the tour was a little overwhelming. Also, one of the romantic things to do in Vienna is visit the Hofburg Palace apartments of tragic Austrian Empress Elizabeth, known as Sisi. Sisi was the Princess Diana of her time. Married at 16 and quickly dissatisfied with royal restrictions, she was beautiful and restless. 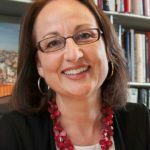 She traveled outside Vienna most of the time. While Sisi was assassinated in 1898, her image and name are everywhere in Austria. We visited Sisi’s apartments as a fascinating excursion from a CroisiEurope river cruise along the Danube River. Vienna is music-obsessed. This funky, high tech museum showcases the range of musical styles and musicians with roots in Vienna, Austria. It’s a good day or night Vienna date idea. The focus is on the Viennese composers like Haydn, Mozart, Strauss. Our favorite was the interactive exhibit that let us conduct the orchestra. And when we messed up, the musicians mocked us – it was funny! While one of the most romantic things to do in Vienna, kids also would love the House of Music. Former Hapsburg buildings, offices, shops, hotels, churches – the architecture in Vienna, Austria is stunning. Vienna is full of ornate sculptures holding up doorways and curvy stone carvings decorating elegant houses. Bonus: it’s free to wander Vienna’s lively streets and enjoy its varied architecture. We especially loved St. Stephen’s Cathedral. The star is its colorful tiled roof and ornate Gothic spires. And seeing both is free. But the inside of the church is also stunning. Even better than staring up at the roof and its elegant Gothic details from the ground was visiting the glass-walled bar on an upper floor across the street from the Cathedral. 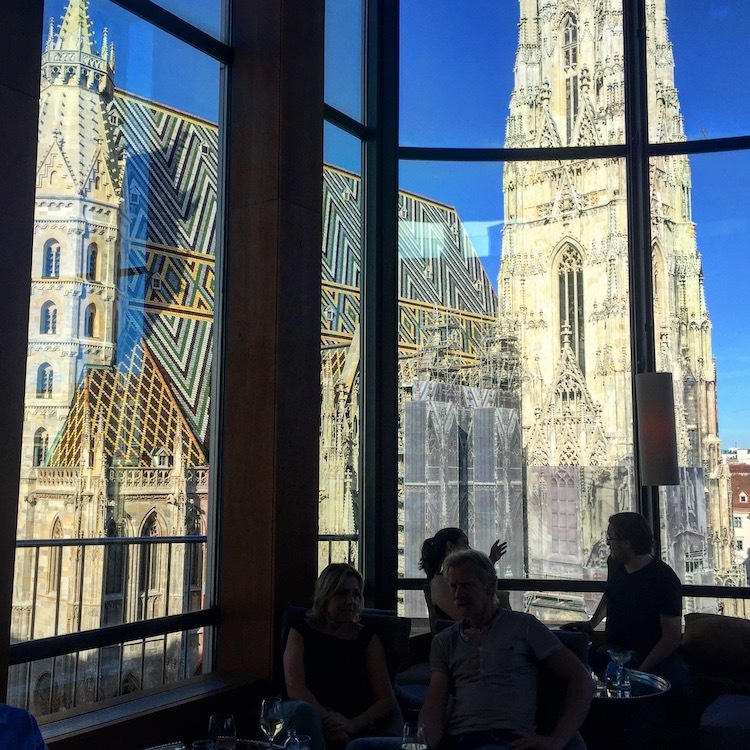 From a comfy seat at the Do & Co hotel bar, we sipped wine as we took in the stunning close up view of the gorgeous roof tiles. In fact, visiting this bar is a good day or night Vienna date idea. Vienna is a pastry city. Viennese pastries are loaded with whipped cream, chocolate, apricot, cherries, nuts, more chocolate, and more cream. Even though I avoid sweets at home, a visit to Vienna was no time to stress about calories. And of course, we had to try the classic Vienna chocolate cake, Sacher Torte, a duet of apricot and chocolate. In fact, my husband and I enjoyed comparing versions, a Vienna date idea. 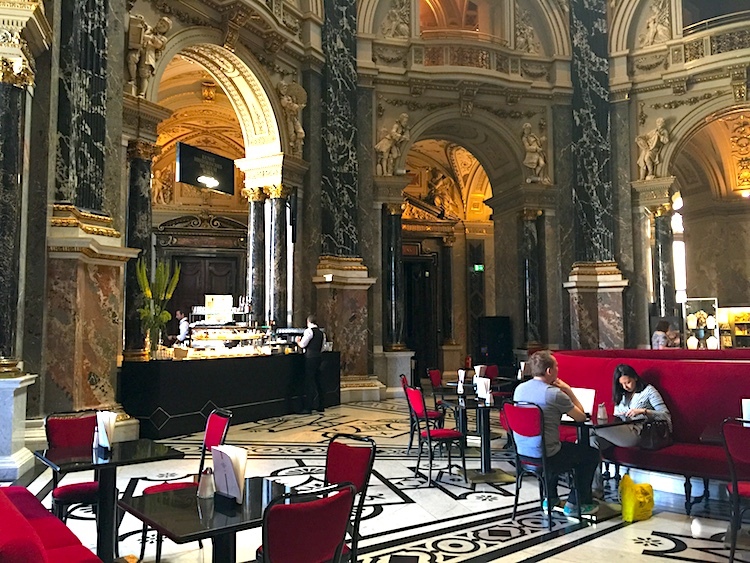 Elegant cafes are inside the Kunsthistorisches Museum and the Belvedere. But the best pastry we had in Vienna was a butter cake at the famous Mozart Café. Among the most romantic things to do in Vienna is explore its gorgeous royal buildings and palaces by night, when the exteriors are lit up. We took a nighttime guided walking tour as an excursion with our CroisiEurope riverboat cruise on the Danube, from Vienna to Budapest. Do these romantic things to do in Vienna appeal to you? Tell us about it in the comments. Such a lovely phrase: “confection of a city. I have only visited Vienna as part of a river . cruise, thankfully overnight in the nearest harbor, but still not enough now that I have all your tips. Thank you. Vienna is just gorgeous. We were lucky to spend 7 weeks this summer in Austria, and we were able to visit Vienna four different times. Not enough! So much more to see. I love the images you’ve shared of Vienna, I’ve always wanted to visit Austria and you’ve definitely convinced me that I need to do it soon. So much beauty in the architecture, gardens – and art! – in Vienna. It was hard to choose just a few photos! I hope you do get to make the trip. A very interesting post! 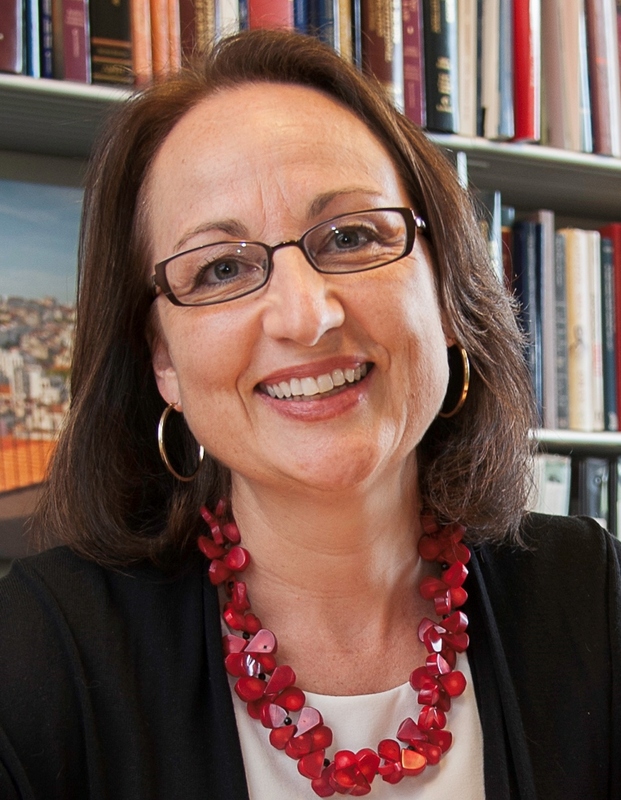 I imagine Vienna to be very romantic, looking at your pictures and the information you provide! Especially the architecture and the atmosphere it creates are very appealing! It is a lovely spot. We’d return in a heartbeat.